As more information emerges about the destruction wreaked by typhoon Haiyan in the Philippines, New Zealanders will have been pleased to note that our government is listed amongst those who have offered help. They may have been less impressed to learn that the initial offer of help offered amounted to just $150,000. The sum offered to meet the desperate circumstances of tens of thousands who lost their homes, jobs and loved ones equated almost exactly – according to another current news story – to the amount claimed in salary and expenses by a single part-time Commissioner in Northland schools. Not only is this juxtaposition surprising in itself, but it demonstrates in a striking way the different values placed today on rewards to private individuals as opposed to spending on public and social purposes. Even the revised offer of a further $2 million is less than the salary paid to some of our higher-paid executives and comes at the same time as new statistical evidence emerges about the rate at which top salaries and directors’ fees have risen by comparison with the wages of ordinary workers. In the ten years from 2003, the salaries of the CEOs of the top ten companies on the NZ stock exchange rose by 137% – a figure that conceals the doubling, trebling and even quadrupling of some top salaries over that period. In a classic instance of “you scratch my back and I’ll scratch yours”, that generosity to top executives was exceeded only by the rise in the fees claimed by those who were responsible for awarding the salary increases – the directors of those self-same companies. Their fees rose by 146%. Over the same period, inflation rose by 32% and average wages by 47%. These figures take little account of course of a range of other remunerations, such as expenses and share issues, paid to top earners. And they take even less account of the favourable tax treatment accorded to the wealthy, and particularly of the fact that – in the absence of a capital gains tax – the principal source of wealth of the already wealthy in New Zealand is completely untaxed. This is a reflection of the phenomenon identified by Joseph Stiglitz, the Nobel Prize-winning economist, who found that – contrary to the comforting story that great wealth is the reward for hard work – the main income enjoyed by the wealthy accrues to them not because they have superior abilities or work harder or create new wealth but because they are already wealthy. Their greatest source of wealth is not the outcome of investment to create new production or provide new jobs – indeed, the net result of their activities (such as asset-stripping) is often a reduction in both production and employment – but the taking of a “rent income” from wealth they already hold and have often inherited. This is reinforced by the research done by Robert Putnam, the American social scientist, who finds that the best chance Americans (and, by extension, New Zealanders) have of becoming wealthy is to be born into a wealthy family. Pre-existing wealth allows the rich to buy advantages for their children – educational privilege, social contacts, exemptions from obligations such as having to work to pay for an education, and job opportunities in family firms or those run and owned by friends – to say nothing of the opportunities to earn the “rent income” from the family wealth they inherit. In the light of these findings, it is not a surprise to find that over the past three decades the share of national income going to profits has risen sharply while the share going to wages has declined equally sharply. Little wonder, too, that over those same three decades throughout the western world virtually the whole of the increase in wealth and income has gone to the very wealthiest; for the rest of us, it has been a case of running faster to stand still, with longer hours being worked and more members of the family working just in order to stop living standards from sliding backwards. Those who peddle the fiction that wealth is always the reward for effort and virtue and that growing inequality is therefore to be welcomed must also accept responsibility for the corresponding and equally misleading canard that hard times and poverty are a proper penalty for fecklessness and laziness. It is hard to imagine any doctrine that – as well as being morally and rationally indefensible – is more destructive of social cohesion and a united country. One of the great achievements of John Maynard Keynes was to prove conclusively that unemployment – the single greatest cause of poverty – was not (as the classical economists maintained) always voluntary. He showed (and experience as well as theory have proved him right) that unemployment would rise if demand – and particularly government spending – fell. For most of those seeking jobs, their only wish is the opportunity to work. 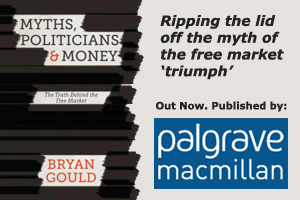 In deciding whether we have the balance right between private wealth for the few and general prosperity for the many, we would do better to frame policy in line with established facts and wisdom rather than conveniently self-serving myths.